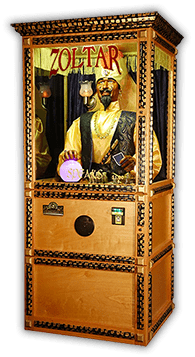 We own the Zoltar® trademark and serve to provide you with the most reliable fortune tellers built to stand the test of time. Zoltar comes in 4 different models: Nostalgic, Deluxe, Standard, and Economy. Compare models by clicking below. Everyone loves the all-knowing animatronic fortune-telling machine that has made iconic appearances in hundreds of locations and in homes around the world. Zoltar inspires nostalgia for many who encounter him. Olaf Stanton and his team at Characters Unlimited build every Zoltar by hand in his shop in Boulder City, Nevada. Here's how the magic comes together. Zoltar can make you a fortune. Contact us today to place an order or request more information. August 18, 2017When you need a fortuneteller or other kitschy animatronic figure to advertise your business, Characters Unlimited has you covered. Editor's note: This tour of small businesses across the country highlights the imagination, diversity, and resilience of American enterprise. What do Donald Trump, Ghost Adventures host Zak Bagans, and Ron Jeremy have in common? Order Zoltar merchandise and fortune cards.